Most smooth types of leather do not fray. However, certain types of sueded leathers may fray or separate as they wear. This applies in particular to the soft suede fabric used for moccasins, clothing and lacings. Keeping suede leathers from fraying is fairly easy and will extend the life of your clothes or shoes. Melt beeswax in a small pot until it is liquid. Do not allow it to boil. Soak sueded leather thong lacing in warm beeswax. You can soak the entire spool or cut the laces into pieces and place them in the hot wax. Fully coat the lacing material and remove it from the wax pot. Lay the lacing on a piece of wax paper to cool and harden. Run the thong laces through your fingers to soften and warm the wax, which also helps to smooth it. Pull it through your fingers a second time as you hold a piece of folded wax paper to remove any excess wax. This should remove most of the flakiness on the laces. Lay the laces between several layers of paper towels if they are still flaky or too heavily waxed, and run a warm iron over them. This should remove any extra wax and flakiness, leaving the laces supple and soft. Dip a small paintbrush into the pot of melted beeswax and carefully run it along the edges of any suede fabric or moccasins that may be fraying. Blot excess wax with paper towels and allow the wax to dry. Run your fingers across the edges after the wax has hardened to soften and remove excess wax. Sometimes smooth leather garments or purses will develop "pills" along the edge of seams. Coat them with a thin film of beeswax as described above. This should smooth seams and keep them pliable. 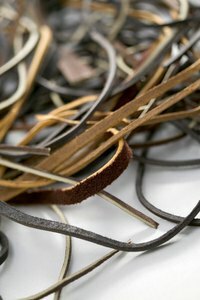 Use the above technique to soften dried leather belts, hair bands, braided items and other sueded leather items. Use care when working with hot wax. It burns skin easily. Additionally, if you drop hot wax on fabric it can mark it permanently. Do not soak large pieces of suede clothing or fabric in beeswax; it will ruin the fabric. Soaking only works well on lacing material. Otherwise, only treat only the edges of leather items.